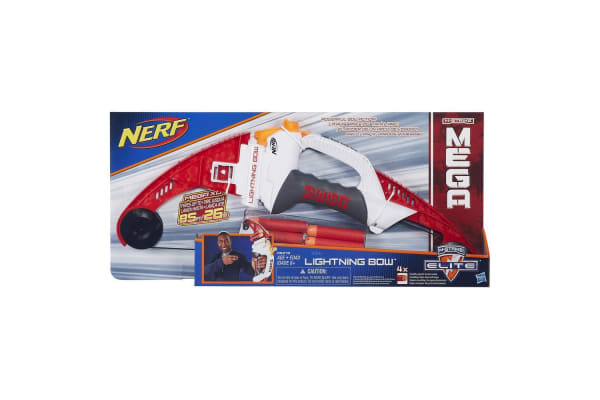 Nerf N-Strike Elite Mega Lightning Bow is the ultimate weapon in your Nerf warsTake your Nerf play to the next level with the awesome bow action of the Nerf N-strike Elite Mega Lightning Bow. Unleash Mega Whistler darts with on point accuracy and see them scream through the air for up to 85 feet. Go on the attack and fire your dart up to 85 feet away laying down cover fire for your teammates. Grab the Nerf N-strike Elite Mega Lightning Bow and enter the Nerf battle fully prepared.